No matter how many dessert tastings I attend I’m always amazed at how creative great pasty chefs can be. Despite the hundreds of restaurants in New York and the thousands of made-to-order plated desserts they offer, top chefs always seem to be able to bring something new to the table–something I’ve never seen before. And remember, I eat a lot of desserts. Last week I visited SHO Shaun Hergatt where Executive Pastry Chef Jennifer Yee showed her creativity not just in the repertoire of techniques she employed but also in her artful, designed presentations. Jennifer Yee’s pastry and chocolate resume is impressive. She has worked for many big name restaurants including Gordon Ramsay at The Connaught, Gilt and Aureole. And in addition to her Patisserie diploma from London’s Le Cordon Bleu she has a Fine Arts degree in Interior Architecture (a link to her full bio is below). After a few amuse plates that included foie gras spheres with squid ink, cherry pate de fruit, and an absolutely superb fish course befitting a two-Michelin-starred restaurant, we were ready to get down to business with the first of the desserts. The desserts loosely followed a spring theme and the first course was a light, refreshing consumme that utilized rhubarb which is in season right now. This dish was memorable because of all the small details. In addition to petit pea flavored ice cream, which is an unusual but great low-sweetness choice, there was a garnish of candied peas made from fresh peas that were blanched, then covered with syrup. 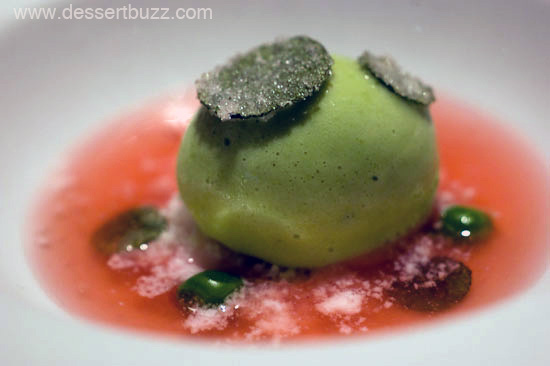 Small discs of of crystallized mint made the dish even more refreshing than it already was. 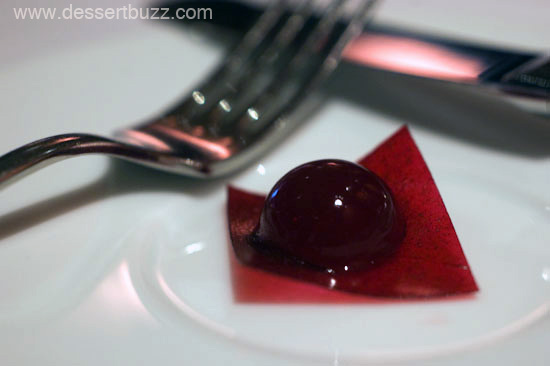 This dish reminded me of Antoio Bachour’s rhubarb soup from a few years ago. Antonio and Jennifer recently battled in the second annual StarChefs pastry competition in New York. The rhubarb consomme is poured at the table. Ms. Lee called this dessert her play on a classic carrot layer cake. This is one of those desserts where you have to use care to get as many components as possible onto your spoon in order to enjoy all the matching acid and sweet flavor combinations. 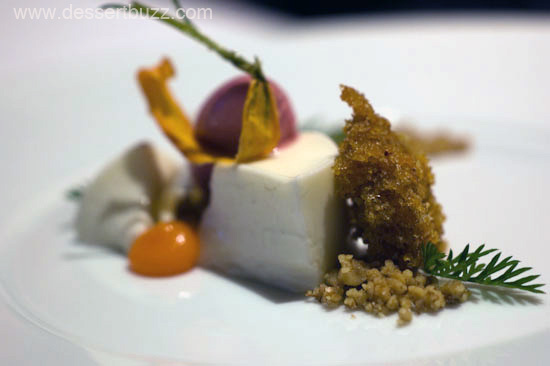 The sweet cremeux surrounds pieces of moist cake, bright orange carrot sauce, and salty walnut rubble. The verjus (a very acidic juice made by pressing unripe grapes) sorbet adds acidity and “pays homage to the raisins found in many carrot cakes” says Yee. 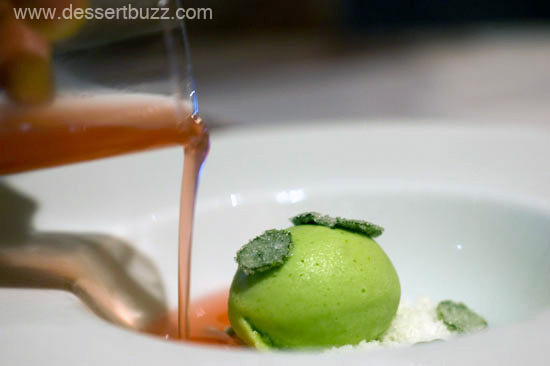 The verjus sorbet is outstanding–they could offer it as a stand alone sorbet. My personal favorite of the plated desserts was the soft chocolate ganache. The ganache is very dark and very bitter. The texture of the chocolate is velvety smooth but there’s not a hint of sweetness–it’s all about the great dark chocolate flavor. 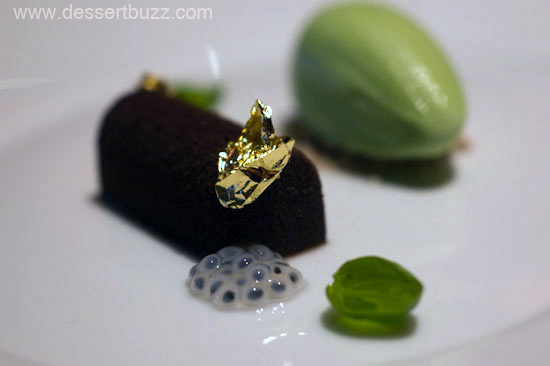 The ganache is next to a scoop of basil ice cream that perfectly balances the chocolate. A small area of salted caramel powder brings a “salty-sweet” aspect to the dish. There are also a few, individual leaves of fresh micro basil and two tiny pools of basil seeds. My lunch companions thought the fresh basil seeds made for a very cool presentation–I agreed. A bit of gold leaf adds to the presentation. Prior to this visit I had read that one of Jennifer Yee’s specialties is petit fours so I warned my guests to leave a little room in order to try some. When the chef delivered the three petit four plates to our table there was a certain swagger in her descriptions. I think she knew these were going to blow us away–both in presentation and in substance. I have experienced (or at least I thought I had) unique and special petit fours before. Recent petit fours plates from two and three Michelin starred restaurants included fresh caneles, flavored marshmallows paired with chocolates and and ultra-mini macarons. All were well executed and delicious, but none had anywhere near the beautiful, art-exibit-like presentaion of these. Plus, all three were fun to eat. My favorite of the three were the “Chocolate mint rocks“. This is a confection close to Shaun Hergatt’s heart. 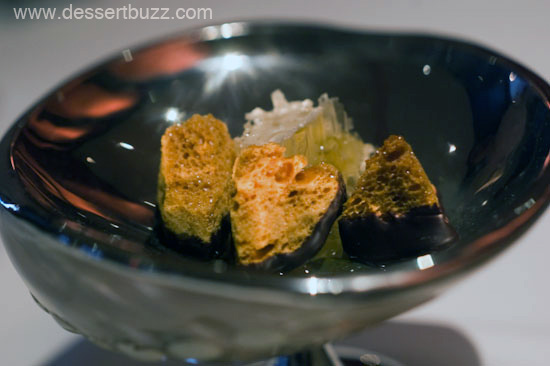 “Honeycomb” is extremely popular in Australia. The chef has fond childhood memories of visiting a “hippie commune” deep in the woods, where the residents would make and sell huge slabs of the stuff to kids. Our version is on a much smaller scale, and we serve it in our signature shell piece with a piece of real bee’s honeycomb. Guests are encouraged to dip the candy in the puddle of honey or use it to sweeten their tea. 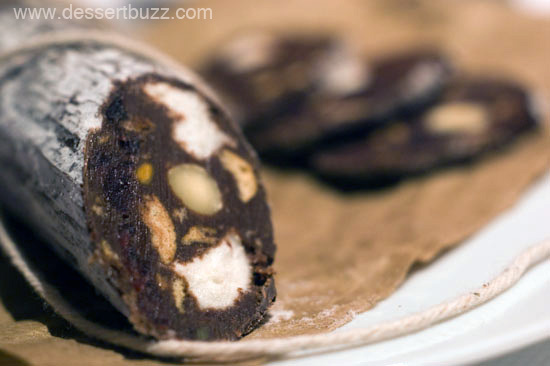 Finally, the most fun and whimsical petit four of the afternoon was the chocolate salami, which could be mistaken for a real salami. Even though the presentation is probably what people remember most, I really liked the taste. It reminded me of Rocky Road ice cream but instead of all the “stuff” being suspended in ice cream it’s suspended in chocolate ganache. When you’re in a fancy setting [like at SHO Shaun Hergatt], we also want you to be able to have fun too. “[even though I work in fine dining] I’m kind of a hippie myself, I like going to second hand stores and love all the markets in New York City–which are getting much better. (she mentioned having recently been to Hester St. Market and visiting the Macaron Parlour booth) I also order desserts wherever I go. Even in a casual place I order dessert. 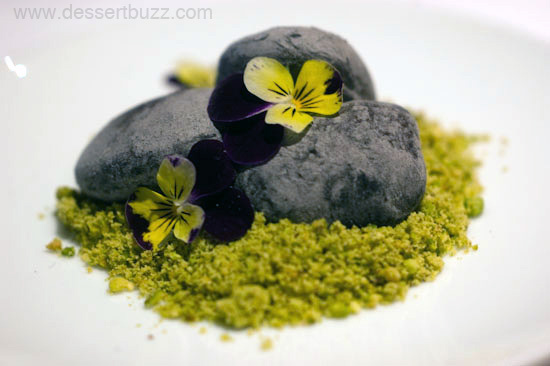 I highly recommend a visit to SHO Shaun Hergatt to try Jennifer Yee’s desserts. There’s a fantastic 3-course lunch pre fixe or if you just want to go for dessert there are plenty of seats in the bar area and lounge. Whichever option you choose make sure you don’t miss what are without a doubt, the best petit fours in New York City. Sho Shaun Hergatt is located on 40 Broad Street (2nd Floor). Jennifer Yee’s website is here. Jennifer Yee’s full bio is here. 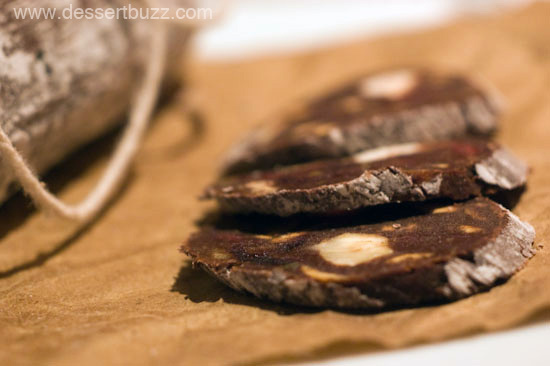 Follow DessertBuzz on Twitter to stay up-to-date on all the latest desserts in New York City. It is lightweight, sturdy and lasts for an extended period of time.